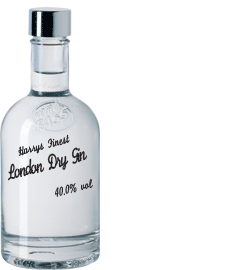 Home › Fruit and other Spirits › Gin, Harry`s Finest London Dry Gin 40 % Vol. Gin, Harry`s Finest London Dry Gin 40 % Vol. Our Gin has been distilled four times, having gone through a long maceration of citrus peel, junipers and other spices. It has a delicious and refreshing flavour. Enjoy by itself or with tonic.